Sometimes a game comes along which is simple yet addictive. Many early home computer games fitted this bill, simply because they didn’t have the graphics or the memory to allow anything more than gameplay to ensure the success of a game. Tetris is another example – Simple, repetitive, yet addictive. Snake too. There’s been a spate of similar games in the past few years on smart phone platforms, and the most recent one that I’ve found myself playing time and time again is Twenty. Twenty, by Stephen French was recommended by Rob Manuel (he of B3ta.com fame), I downloaded it more in curiosity than expectation. The premise follows that of similar games like Three! Or 2048 where you match numbers together to win the game. Twenty has the extra dimension of the screen scrolling as time goes on. Although there always seems to be a way to make a move (unlike 2048, for example where it’s possible to just run out of moves), Twenty relies on your speed at moving tiles around to make things fit. Start with the screen on the left. Pull the coloured blocks around and match them together, Things kick up a gear at level 10 when the blocks start becoming attached, Can you get to twenty? It can be frustrating in the same way that all good games are. There’s been many times when I’ve let out an exasperated sigh, only for my other half to look up and mutter sarcastically “What’s the matter, darling, can’t you win at your little game?”. The phone is then put to one side in frustration before being picked up again a few minutes later for another attempt. 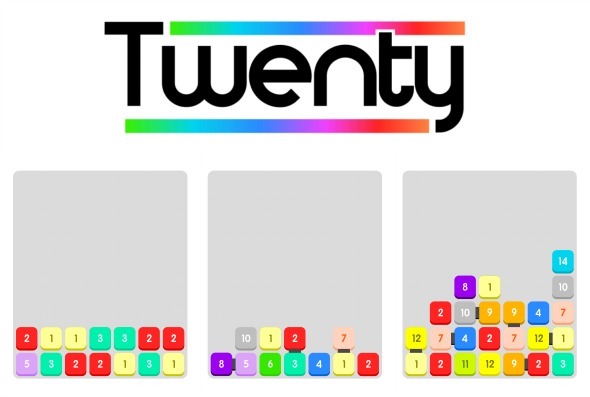 There’s also a fantastic two-player version (called TwentyTwo) which is in the same app. It’s a split screen version of the same game where two people compete to get to twenty first. Not only is it a race against another person, it also has an added layer of evilness which allows you to encroach on your opponent’s side and steal their tiles – helping you get closer to your goal whilst simultaneously slowing them down. The game is free on both Android and iTunes, and although it offers In-App Purchases, they merely unlock additional ways to play the game. The full cost of the game - well worth it, even if you only play the (free) original game. The main one-player and two-player games themselves remain free to play in full. 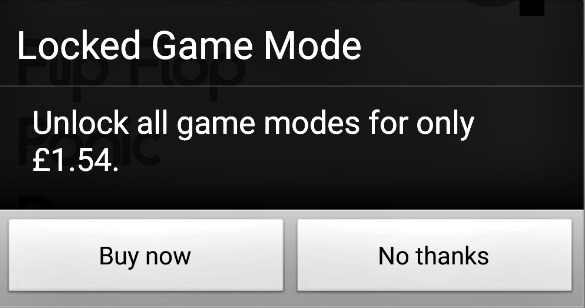 What’s more, there’s no Candy Crush-esque options like having to beg Facebook friends for extra lives. It’s well worth a download, and though it’s equally fun and frustrating, it’s a game that is worth having. My only complaints would be that the two-player game, as fun as it is, isn’t necessariy suited to playing on a smart phone and is probably better suited to a tablet. That’s hardly a development fault though, and it’s still possible to play using a smart phone. The other issue is that the game itself seems to be a real battery drain. Every time I play it, I seem to have a few games, close it down and find that my battery has plummeted. It’s not drastically bad, but it’s an area that could do with some improvement. Overall, it’s a game that is worth downloading. It’s given me hours of gameplay on my own as well as playing the two-player mode. Download Twenty by Stephen French on Twenty by Stephen French - Android or download it on Twenty by Stephen French - iTunes. Really amazing game. I have played another game ” Mo Memory”. It’s an awesome game to have fun with your friends.